I’ve never been so excited…. 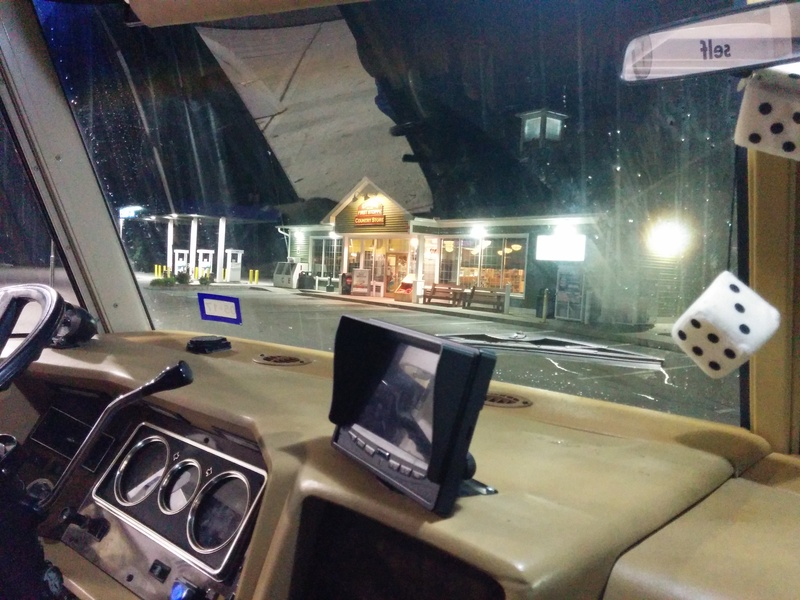 so giddy… to hang out at a truck stop. To the uninitiated (read: me), I thought they were “gross”. No more thought beyond “gross”, just “gross”. All that nonsense stops today. These places are fascinating. It turns out… you can stay in the parking lot of these places for free. They have actual parking spaces for big trucks and we’re allowed to just… park here…. overnight. Big Bonus – I get to have a Dunkin Doughnuts coffee in the morning that Scott told me I really “ought to buy” and it’s only about 20 steps away. What kind of awesomeness is this?!!? We hit the open road today. Scott got the all clear this morning. As per the plan, we left after dinner. We had a great last-evening-with-Grandmom-for-awhile. After that, the kids had one last luxurious bath. We combed the sharks and bats (don’t know where bats came from, Evie recently added it) out of Ev’s hair. I took a shower and shaved everything that needed to be shaved (who knows when that will happen again) and gave up on the rest. Scott wrote some work emails and puttered around the RV. Jack kept his little arms wrapped around Granmom’s neck as much as possible. When the kids were good and tired, we started final preparations. Boy it tough saying goodbye. Grandmom is like a guardian angle/Betty Crocker/calming presence constantly-involved-in-interesting-things-like-gardening-and-walking-to-the-mailbox-and-making-cookies VIP in the daily life of the kids. It’s not even like it’s that long until we’re going to see her but it’s always so hard to leave. To add insult to injury… in the middle of a robust drought… the skies opened up. We were all soaked as we climbed into out seats. Good one, universe – very funny. 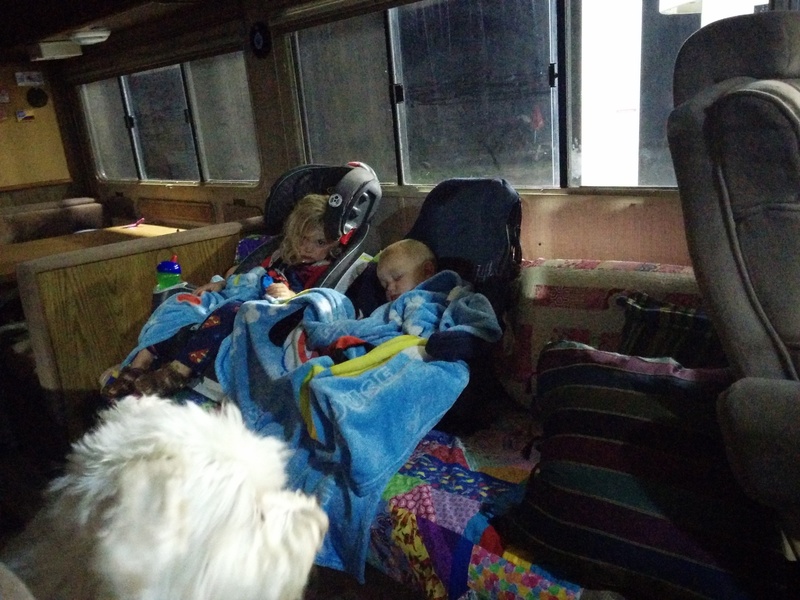 The kids fell asleep on queue. 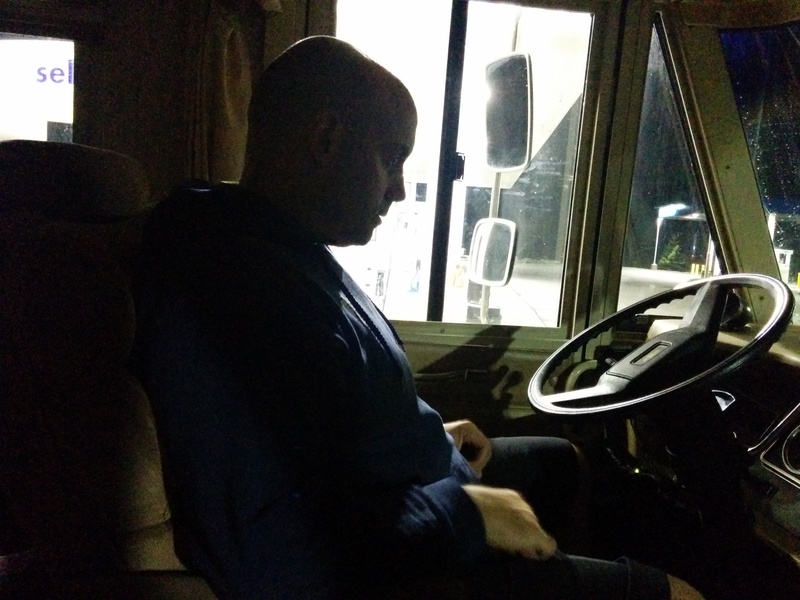 We drove almost 3 hours and found a truck stop. Tomorrow we’ll drive a few more hours and be in beautiful southern Vermont territory where we’ll hunker down for a few days. As we were putting the kids in their beds and taking the dog for a short walk it hit me. We’ve launched. Years of dreaming and planning all came together and we’re on the road tonight. I had been waiting to write the Bumfuzzles an email until I had something interesting to say. I finally felt like I’ve earned the credibility to say “I’m not just a follower of your adventures, we’ve set off on our own as well. Thank you for providing the first inspiration.” I didn’t actually write anything that corny, but you get the idea. Here we are – in my new favorite truck stop in Candia, NH right off the 101. I wouldn’t rather be any place else on the planet tonight.